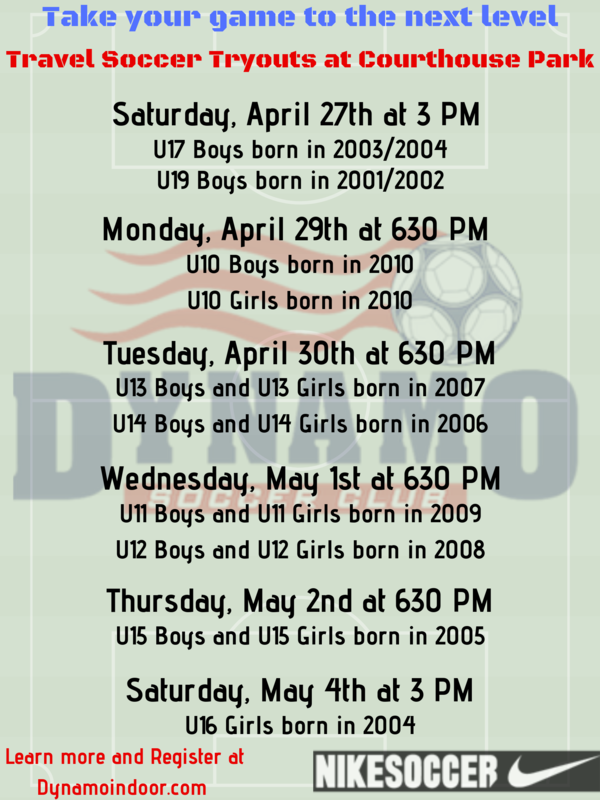 Dynamo Travel Soccer requires a tryout to make one of our teams. Players are evaluated on physical, technical, social, and psychological aspects of the game. Each age group will have 1 tryout day. Players trying out need Cleats, and Shinguards. After trying out, a response will be emailed to the recipient whether the team was made or not in 24 to 48 hours. If a player makes the team, they then have 24 to 48 hours to accept the offer. Held at Courthouse Park - 7232 Courtland Farm Road, Hanover Virginia. If a player misses tryouts due to travel, injury, etc, and want to join a Travel team mid-season please email our Travel Soccer Director Shawn, at shawn@dyanmosc to potentially schedule a personal tryout. If a player who played for Dynamo is injured and unable to try out, that player will be evaluated based off of prior playing experience for tryouts.